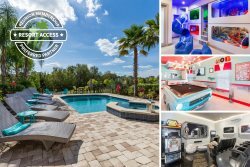 If you want to be a part of a resort experience during your unforgettable Orlando vacation, and you’re of the mind that more neighbors just mean more opportunities to make friends, AND you have learned to expect a certain quality from your vacation rentals, then you may be very happy with your choice to rent a Reunion Vacation Homes condominium. Luxury, elegance, and value are the keystones to our mission of making our guests happy. Renting a condo allows you to take part in the perks of resort living, early tee times and poolside refreshments, and with many of our condos being spacious models with enough room for up to eight guests to sleep comfortably, you may find it difficult to remember why you need to return home at the end of your stay! One of the many advantages of condo living is the ability to move up. The higher the condo, the more incredible the view! Orlando is a beautiful city, one that is colorful, vibrant, and happy, and when you stay in a condo seven floors up, your view of your surroundings is unparalleled. Sitting on your covered balcony sipping wine as the sun sets behind nearby buildings just once will change your life forever. Inside, the spaciousness of the condo may amaze you as it spreads out before you. Wood floors, plush carpet, or gleaming tiles that feel cool before your feet; you can expect only luxury materials to be used in a Reunion Vacation Homes rental! The fully equipped kitchen is the heart of the home, and the richness continues in here. Granite countertops, custom cabinetry, and high-end appliances turn the chore of meal prep into a treasured activity when shared with your daughter. The living areas feature comfortable furniture, state of the art electronics, and oversized windows that fill the condos with light. The bedrooms contain premium mattresses with high thread count linens, the bathrooms hold white fluffy towels that actually cover your entire bodythe beauty is in the details we never overlook! There’s always something to do in Orlando, and if powerful animals, exciting rides, and spectacular shows catch your interest, we suggest you take a trip to Disney’s Animal Kingdom! Kilimanjaro Safaris give you an up close and personal glimpse into the wildest of nature’s creatures, Disney Musicals will bring a song to your heart, and if you have the extra time and money, you might want to consider a VIP behind the scenes tour of the kingdom. Take a walk on the wild side where not many have traveled before! Cabana Court Paradise - Ultra Modern 3 Bed Condo with PS3! Sunset View Haven - Brand New Furniture and PS4!